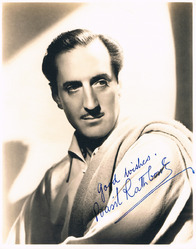 Great 8x10inch matte stock photograph signed by Basil Rathbone. Purchased from Dealer Jerry Redlich in 1977. Sold to Nelson Bell October, 2011.